At the beginning of the series, Zero is a thirteen year old wizard-in-training. He is taking the magic exams with his partner, Ichî. They planned on getting the Crystal Pearl and winning the Magic Exams, but there plans change when Nina, a human girl, swallows the pearl. When the Magic Examiners here about this, they inform them that a potion to remove the pearl won’t be available for another six months, by the time the exam is over. Much to Zero’s aggravation, Ichî says that they will have to protect Nina until the end of the exams. Zero often argues with Nina, and calls her an idiot. This causes Nina to often physically hurt him. He and Ichî enroll in Nina's school to make sure she is safe at all times, and have secretly created a magical space in her closet where they live. Many other examinees try and attack Nina to obtain the pearl, but Zero and Ichî always end up saving her. As time passes, Zero begins to develop feelings for Nina. 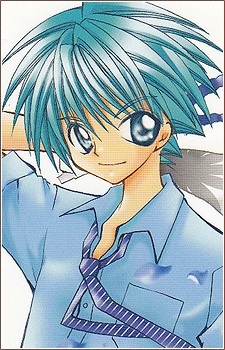 Zero was born into a rich family, and when he was ten years old, his older brother, Jeff, was engaged to a poor girl. Zero met her step brother, Ichî, and witnessed his power. Right away he wanted to enter the Magic Exams with Ichî. Originally Ichî planned on using Zero, but Zero was to naïve to notice, and was willing to do anything it took to become Ichî’s partner. Eventually, Ichî and Zero’s powers are combined to defeat a powerful enemy, and the to become the best of friends. They eventually enroll in a Magical Cram School to prepare themselves for the Magic Exams. We never meet Zero's parents, though we have heard of them. Whether they are dead or alive is unknown. All we know is that they planned an arranged marriage with him and Kuku. Eventually, when given a potion, the pearl is removed from Nina’s body, and so she gives it to her friends, and leaves. Eventually, everyone attacks the pearl, and they lose it. Nina finds it, and tries to give it to her friends, but it comes right back to her, no matter what. In the end Zero and Ichî manage to win. The examiner, Will, comes to congratulate Zero and Ichî, and the pearl hatches into a dragon familiar, which is later named, Pearl. Though when Zero thinks the dragon is his, Pearl explains that Nina is in fact his master. When Will hears this, he explains that since the Crystal Pearl was inside of Nina, it has grown a bond with her instead of the winning team, and that it is now Nina's familiar, and that Zero and Ichî are to stay another year, and help her raise it. Nina is now being targeted by Kingdom, a group of magicians after her power. Things begin to heat up between the three teens, and Nina must decide who to pick. In the sixth book, Zero’s feelings for Nina are returned. Zero ends up dying to protect her, but Nina uses her magical powers to bring him back to life. The second series takes place in the human world, there has been a two year time skip, so Zero is now fifteen. There is another round of the wizard exams, for advanced wizards only, and Nina, once again, accidentally swallows the magical object being targeted by wizards, the Crystal Drop. Pieces of the Crystal Drop come out a few at a time, and so the new objective of the exams is to see which team can find the most pieces of the drop by the end of the exam, so this means that Zero and Ichî must once again protect Nina. During this story, it mainly focuses on Zero and Nina’s relationship, and the troubles they go through. Though no matter how hard things get, Zero loves Nina no matter what. When Sarasa comes to visit Zero and Ichi in the human world, she informs them that Zero must come back to the Magical World to get married. When in the Magical World, Zero’s grandmother informs him that Jeff left, and that Zero must now become the heir to the family’s fortune, so that he must marry Nina. His grandmother goes as far as canceling the Advanced Magic Exams, and so Zero and Ichî travel to get the Stardust Stone, an object that will break the contract. With Nina’s affection for him helping him on the way, Zero and the others manage to break the contract, but now his grandmother is planning to force Nina into marrying Al, unless he comes back and marries Nina himself. Zero and the others go back and destroy the wedding, and Jeff returns. Zero and Nina then have a ‘pretend wedding,’ which causes the final fragment of the Crystal Drop to come out, making Zero and Ichî the winners of the exams. A year passes, and Zero and Ichî try out for the exams to become a Magical Police Officer, which takes place in the human world. Meaning they get to see Nina again. In the epilogue, of the first series, ten years have passed, and Zero proposes to Nina, and she says yes. In the epilogue for the second series, Nina and Zero have two kids together, Rei and Mina.